Because of the perfume, war clearly was on my mind that day. – Oh, no. Those are just fluorescent light tubes. – Ah, I see. That’s reassuring. I was wearing Lieber Gustav 14 by Krigler. You might wonder how the perfume, notes of which include lavender, black tea, tonka bean, geranium, leather and sandalwood, prompted those violent thoughts. I could have told you that it was because the perfumer created Lieber Gustav in memory of his daughter’s fiancé who had been killed in WWI. But everything was much simpler: I chose Lieber Gustav as a perfume for the NTS’s Gender Wars Friday community project. While in the U.S. lavender is one of the most ubiquitous scents used in … everything (alongside with lemon/citrus, strawberry and rose), it wasn’t cultivated or widely used where I lived as a child. So until I moved to the U.S. in my late 20s the only thing I knew about lavender was the word itself. I’m not sure if that played any significant role in my affection towards lavender. Or maybe it was thanks to Yves Rocher‘s lavender oil that I used on pulse points when I or my vSO couldn’t sleep – and it seemed to help. Or was it a wonderful gift from a friend – “Do not Disturb” Lavender Spa Relaxation Heat Wrap* – that over years soothed many of my pains and left me feeling warm about that scent? Whatever it was, I like the smell of lavender – in body products, sachets and even food. I was surprised when I realized that I also enjoy lavender in perfumes. In perfumes that I like lavender can’t be too “simple”: both Yves Rocher’s and Demeter‘s lavender scents went directly to the linen closet. For a while I thought I liked Brin de Réglisse from the Hermessense collection. I even bought a travel bottle. Unfortunately the first couple of hours of licorice are killing it for me since I strongly dislike licorice in any form. By the time it subsides enough for me to tolerate it (or maybe I just get used to it), like most perfumes from this line it’s barely noticeable on my skin. I should probably consider Brin de Réglisse as my first official “albatross” (© Olfactoria). Before I tried Lieber Gustav 14, I didn’t know anything about either that perfume or that brand. I didn’t know the perfume had lavender as one of the main notes. A friend of mine gave me a sample and offered a bigger decant later from her bottle if I liked it, in which she wasn’t sure since Lieber Gustav isn’t too popular in the Perfumeland. It was love at the first sniff! I decided not even to go through that illogical stage of getting a decant but saving the last couple of drops and not using it up completely and at the same time not buying a bottle because decant hasn’t been finished yet. With just the right combination of lavender, leather and woodsy notes Lieber Gustav is a truly unisex perfume. Leather in this perfume isn’t harsh or strong but it’s definitely leather, not suede. Lavender is aromatic but not medicinal. It’s the second perfume in my collection that I equally love on me and on my vSO (I haven’t tried it on Rusty). Serge Lutens‘ Gris Clair is another lavender perfume that I like. In several reviews (both positive and negative) Gris Clair was called cool or even cold, which was very surprising to me because it wasn’t how I perceived this perfume. It smelled like lavender and heated… heated… but what? Not soil or grass or road – something cleaner. For a long time it bothered me that I could distinctively smell a certain note but even though the recognition was on the tip of my tongue (nose?) it kept slipping away. And then I found and re-read Christos’ (Memory of Scent) review of Gris Clair. He called it “hot iron note.” Of course! It’s exactly what I smell. And since I like ironing (yes, I know how strange it sounds for most people), I’m not surprised my small decant is almost empty. I’m not sure though what to do next: I recently tried another Luten’s lavender perfume – Fourreau Noir – and liked it even more than I like Gris Clair. And since it’s a bell jar perfume, I should probably save my lavender-allocated budget for it and get my hot iron note directly from the source. Do you like lavender? Do you wear lavender-centered perfumes? * Do not Disturb wrap on the pictures is the “second generation”: after I wore out the first one I bought a new one here (I’m not affiliated). This entry was posted in "Four legs good", Favorite Perfumes, Single Note Exploration and tagged Brin de Réglisse, Fourreau Noir, Gris Clair, Hermès, Krigler, lavender, Lieber Gustav, Serge Lutens. Bookmark the permalink. First of all, i know Rusty gets a reward for cuteness recognition, so a big treat for him! He is a dream model! I love lavender in perfume, and in bath products, and for burns (takes the pain away instantly! ), and for whatever. I have some essential oil in a spray can that i spray my room and bed with. My favourite is probably A Taste of Heaven by Kilian. Yum. Also Kiki edp by Vero Profumo. It works so well with passionfruit! Guerlain AA Lavande Velours I got at a steal, and is basically lavender and violet, but lovely. Caron Les Plus Belles Lavandes is a vanillary lavender. I dont know how it compared to the mens Pour Homme as ive not smelled it yet.. I havent heard of or seen the one you mention, but its going on my to-try list. It sounds fabulous!! I didn’t think about A Taste of Heaven. I have a sample, I should re-test it, thank you for the idea! I also look forward to testing Kiki. As to the AA… Since it’s a discontinued perfume I shouldn’t probably even try looking for it. But if I ever come across it (or if Guerlain re-issues it), I’ll give it a try. Woo hoo – you got your Krigler! I do like lavender but don’t wear enough of it (I am looking at you Fourreau Noir). Although not lavender-centered, I like its treatment in L’AP Seville a la Aube. I have to dig out my decant of Caron Pour Un Homme to get the full lavender effect. Rusty couldn’t decide with which ribbon to play first – a “stand-alone” Krigler’s one or the one on the wrap’s package. So I think he’s not calm but rather pensive. I think the lavender is what makes orange blossom less flowery to me, if that makes any sense. I’ve never tried a lavender perfume, but now I’m tempted to seek out one of these! I haven’t tried any of the two you’ve mentioned. It should be easier to get HdP’s one to try but Ranja J. isn’t available in the U.S. yet. I don’t care for lavender in any format, although I would really like to use one of those soothing herbal pillows, as goodness knows I need help in getting to sleep at the best of times! 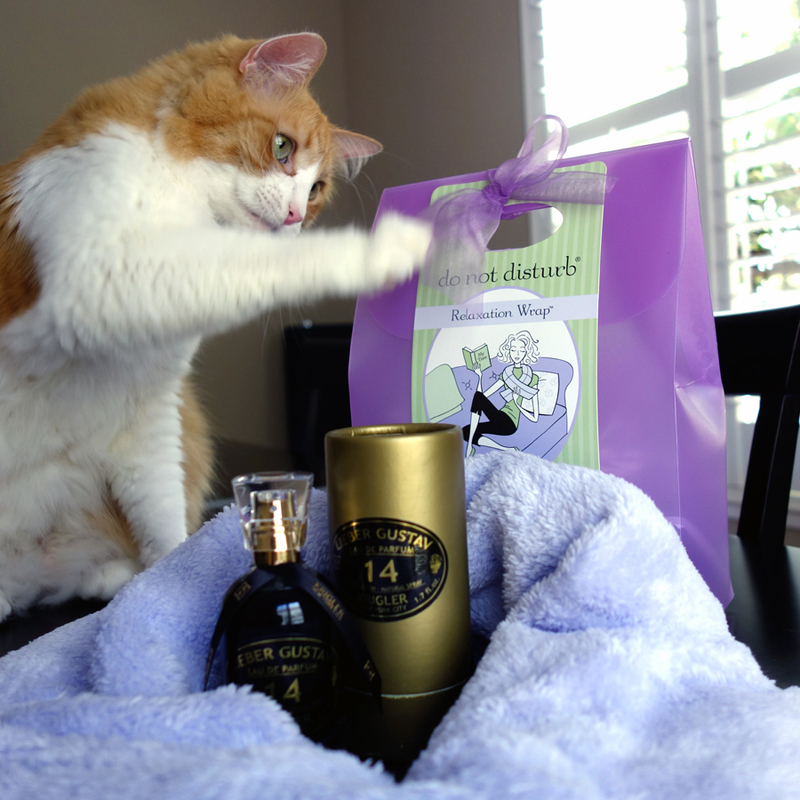 I now know who is going to be the recipient of my stockpile of lavender soaps people keep giving me… The only perfume I sort of don’t mind the lavender in is Kiki, as several people have mentioned, also those classic men’s colognes that often have the note in. It is also tolerable in Seville a l’aube. I’ve tried only four of their perfumes so far and I didn’t dislike any of them – so I look forward to visiting one of the two boutiques one day (and I’m not sure which one has a better chance – the NY or the LA one). I love the smell of lavender in many things, but shy away from perfumes with a strong lavender note. With one exception: Fourreau Noir. There is a bell jar in Paris with my name on it…probably next to yours. Undina I highly recommend you get the Fourreau Noir and that special edition bottle is gorgeous. When I try it on friends they usually all fall for this as well. I do like lavender in perfume but where I am in France you can easily get put off due to the tourist shops selling the sachets everywhere that don’t smell that good at all. I also agree with Lucas who likes Rania J’s Lavande 44. 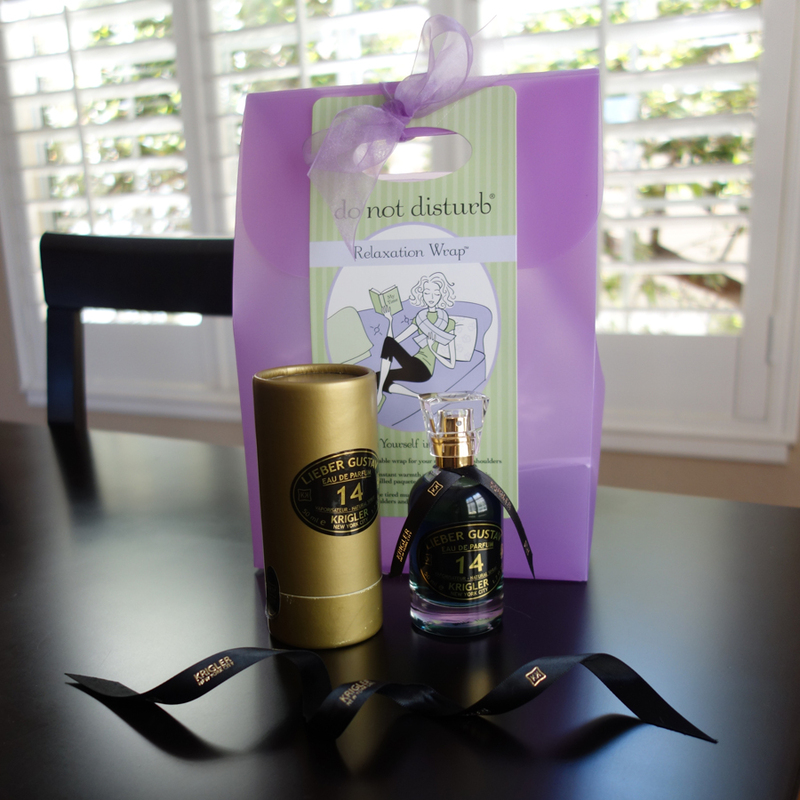 Kiki is great too – although have only tried the EDP. The Au Pays de La Fleurs d’Oranger Lavande Ombree is fabulous – leather and lavender. I’ve never heard of Krigler perfumes. You’re the first person I’ve seen write about them. Rusty looks very cute. 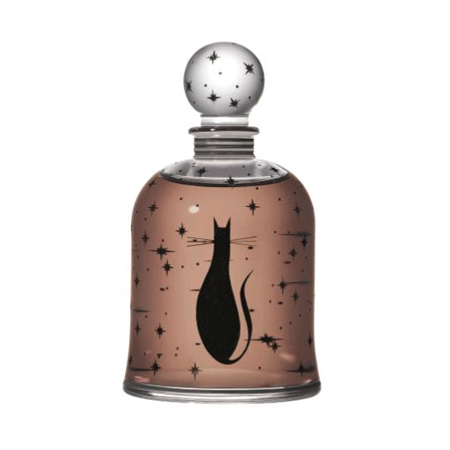 I’m almost glad that the special edition bottle isn’t available any longer because I might have spent all my perfume budget on it ;) But I think that eventually I’ll get at least a decant of Fourreau Noir but maybe even a bottle – we’ll see. If it weren’t for my friend who gave me the sample, I would have never tried their perfumes as well: while there are just two B&M boutiques where they are sold, they charge $16 per 2 ml sample, which is a little extreme, in my opinion. On the whole I am not a big lavender fan, though I really love the scent of the seventh generation lavender floral mint dish soap. I’m surprised to read in the comments that it’s in Seville, I’ve never noticed it. One other lavender I don’t mind is the Caldey Island lavender. Have you tried that one? Not only I haven’t tried Caldey Island lavender, it’s the first time I hear about this brand and, from what I’m reading now, it’s not delivered to the U.S.
I’m with you on L’Artisan’s perfume: I haven’t noticed lavender in there. I’m not great onlavender scents myself, although I do love Mouchoir de Monsieur, and own a bottle, a decant of Jicky is more than enough. The Krigler and Lavande Ombree (mentioned by Megan) both with the leather-lavender combo sound nice, I should probably look at those. I got very curious to try Lavande Ombree: I might even buy a sample. I see what you mean; Andersen’s tales are a lot about shallowness vs truth, and truth in his universe often being equal to art, there’s not a lot of room for shallowness however consistent :-) I know all these so well, that I rarely look at them in new ways, so thank you for that. You made me look around for Krigler, but they seem hard to come by, and samples from their website are from 16$ for one !!! I love using lavender in bath products and essential oils but not in perfumes, even though I like floral scents. But how can you include lavender scent in food though? Love the last bottle [with a kitty, and a real kitty in the photo above though, so witty]. Thanks for the post, Undina! Hope you can find more perfect lavender fragrances! Thank you, Melissa (from Rusty as well since he’s getting a treat for every compliment in comments ;) ). The first time I saw lavender in something food-related (I think it was in some mixed spices) I was surprised. But since then I tried many different lavender-infused deserts (baked and ice cream), some meat and vegetable dishes as well. So now I know it might be used for cooking with good results. Yes, I do love lavender and how nice you found the Krigler, one of the best out there really, and why don’t most people know about Krigler? Probably the no shops, no advertising, only one web site policy. Plus they are pricey- but often worth it. I love old Mouchoir de Monsieur for lavender, also in this heat Eau du Cologne du Coq which has just a touch. For cheap thrills, there’s also vintage Yardley’s lavender on Ebay, the talc is often quite good. I do not mind Krigler’s prices for bottles but I strongly object to their samples pricing. And they aren’t generous with those samples even when you actually buy something from them. They remind me of Ormonde Jayne in that respect. I hope to visit one of the boutiques at some point: I’d love to try their other perfumes. My favourite lavender fragrances are Kiki, Gris Clair and Jicky. I’ve never tried Lieber Gustav 14 but I’d love to give a sniff. 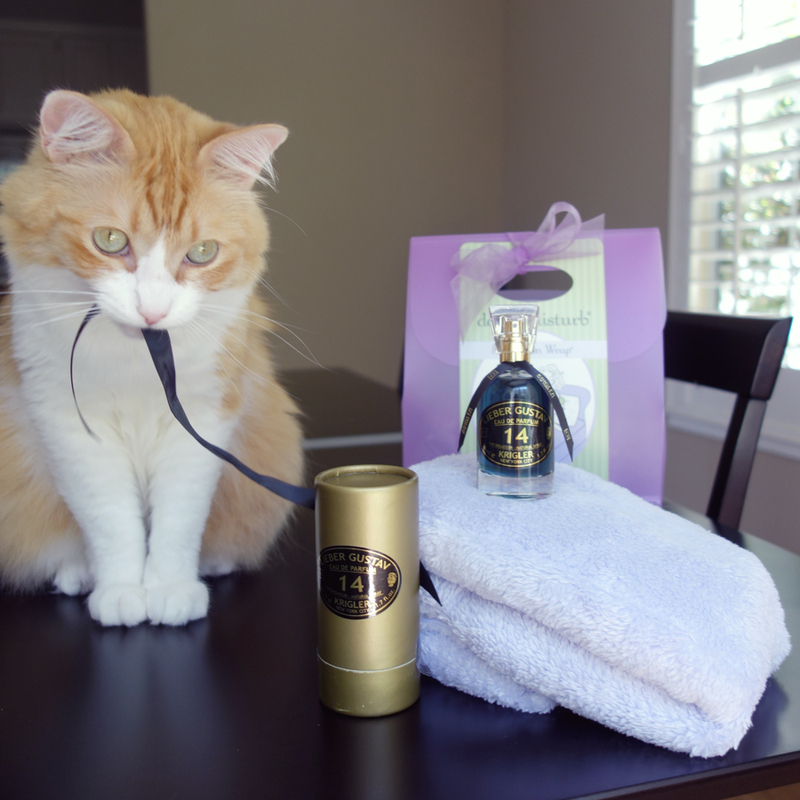 One more treat goes to Rusty – thank you! There are a few perfumes that feature a prominent lavender note that I love, but not too many of them. I really like lavender when it is a clever accent note in a perfume (as in Michael Storer’s Winter Star or in Ava Luxe Café Noir), and I like to smell the actual plant when it is in bloom. Interesting to hear that you love to iron!. My mother loves to iron, too, while I’m just the opposite. She finds it very calming, whereas I find it a frustrating endeavor in which I usually end up with more wrinkles (and deeper ones) than there were at the start. I liked that picture with the ribbon as well: I like his face expression. He was really amused with all the elements of the photo shoot and it was much easier to take pictures of him this time. I haven’t tried either of the two perfumes you mentioned but I’ll try to remember the names. Great post. I love stories you weave. I need to re-try Eau de Lavende but from what I remember when I tried it at the store: there wasn’t enough lavender in it for me. Hi Undina, it’s always nice to see Rusty making an appearance in your photos! He seems to be okay with lavender. I really enjoy fougères, so I definitely like lavender in fragrances. Although the only truly lavender-centric perfume in my collection is Diptyque’s Eau de Lavande. I sampled Gris Clair thinking that I would love it, but it was extremely sweet on me for some reason? It wasn’t cold or metallic, just strangely sweet and, needless to say, not my favorite. I’m intrigued by Fourreau Noir though, and that special edition bottle is amazing! I hope you get a bottle of it one of these days. Brin de Reglisse I too have a travel of and wear it mainly on holiday. Rusty is TOO cute, can you treat him from me please? Dear Portia, Rusty got two treats in your name (so he likes you almost as much as I do ;) ). I usually do not notice lavender in a supporting role but now it explains why I liked that much Gucci Envy Men on my vSO. There’s a few of us who agree that Gucci Envy Men was really special. What a fragrance! One of the Aussies has stockpiled nearly a liter. That’s dedication. I can’t believe you actually asked him about the shot gun! LOL.. Taste of Heaven didn’t work for me and I didn’t try Reverie au Jardin yet. And I completely understand that price game: I didn’t buy Cuir de Lancome when I could for $35 and now I can’t bring myself to paying $75+. I’ll wear Jicky tomorrow to see if I can smell lavender in it. Let’s see..do I like lavender? YES!!!! That bell jar is absolutely gorgeous!!!! I think my favorite lavender will always be Yardley’s English Lavender and pure lavender essential oil. I have wonderful pure lavender essential oil I brought from my last trip to Hawaii. I heard many good things about Yardley’s perfume but I don’t think I’ve ever tried anything from the brand.